Here are the Vegas lines for the starts for each of the five first round quarterbacks picked this year in the draft. Allen has the largest number of any of the quarterbacks drafted. This may come as a shock to some Bills fans. The reason behind it I think is because he has two quarterbacks in front of him in Nathan Peterman and AJ Mccarron that Vegas doesn’t have much respect for. Allen has practiced with the three’s most of OTA’s and mini camp. Looking at the Bills schedule I feel the obvious spot to put him in is against Chicago at home on November 4th. This would give him eight starts. Before that you have tough road games at Minnesota, Green Bay and Houston. You all so have a Monday night game against the Patriots. These seem like bad spots to put the rookie in. I go with eight starts this year so my bet is UNDER the Vegas total. Hue Jackson has been saying all along that Tyrod Taylor is his starting quarterback. Offensive coordinator Todd Haley came out last week and said that Tyrod has been the perfect leader for this offense. Haley went on to say that Tyrod is the first one here in the morning and last to leave at night. Tyrod and Mayfield appear to be turning into good friends. The Browns are one of the most intriguing teams in the league. They lost every game last year but they have a ton of talent. I believe they have the second most talent in the division. I think Tyrod hangs onto the job for at least half the year. I bet UNDER 9.5 starts for Mayfield. Word out of Arizona is that Josh Rosen look great so far. Let’s remember that Rosen was the most pro ready QB to come out of the draft. That’s not saying he will be the best but it is to say that he is the one that can take over the fastest. Sam Bradford has health issues and the Cardinals are in a brutal division. 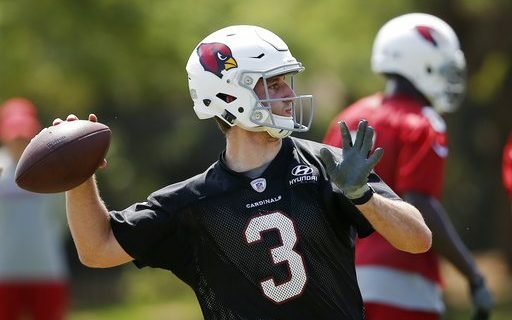 I see the Cardinals turning the reigns over to Rosen very early maybe even at the start. I’ll take OVER 8.5 starts for Rosen. I was surprised this number was so low. I know that Josh McCown had a very good year last year. The Jets are throwing everything at Darnold in the spring. They want to see if he can handle being a starter. The Jets have said if he can handle it and prove he can handle the job being the starter in Week one is on the table. Teddy Bridgewater is in the mix as well for the starting job. All that being said the fact the Jets are taking the gloves off early with Darnold and letting him compete to go along with the fact that the Jets shouldn’t be great this year, means I’m taking the OVER 5.5 starts for Darnold. Jackson was the last pick in the first round for the Baltimore Ravens. Jackson clearly has the most to grow into the position. You have Joe Flacco in front of you as well. The Ravens in the spring have been using Jackson in multiple positions. In the last practice he took the majority of throws with the ones. The question here is how good do you think the Ravens are going to be. If the Ravens are fighting for a playoff spot then Jackson never starts unless Flacco gets injured. I feel that the Ravens will not be a great team this year. They have a tough schedule playing the NFC South. The Browns won’t be two easy wins anymore either. I think the Ravens fall out of the playoff race and I will go with OVER 0.5 starts for Lamar Jackson. Bob also knows the Bills playoff hopes are good because they’re not the only AFC team with questions.